Just because you’re the boss doesn’t mean you’re a leader. The two roles have different characteristics. But if you try your best to be the latter, you will most likely succeed as the former. The best part of the piece is a story Vishnepolsky uses to illustrate his point. Years ago, he writes, his company got a new boss. From the day of arrival, things were different. And then a crisis occurred. A system administrator made a mistake and unplugged the wrong cable, disabling a critical server and causing a major network outage. When called before the new boss, the administrator, expecting the worst, began to apologize. Soon afterward, the boss noticed his tech support team was doing a poor job of processing service tickets. Instead of reprimanding them, he found money in the budget to send them to training. As time went on, the boss did other things to create unity and enthusiasm. He allowed flex time for working mothers, took his staff to ballgames and encouraged new projects. In return, the boss got a dedicated, motivated workforce. Most of those who left the company went on to successful careers elsewhere. Culture separates the great from the average. Good leadership breeds a good work force. Which in turn increases productivity. You will work over time and weekends when you feel appreciated and supported. I also think actually working alongside your staff shows your commitment to the work/project. You earn respect that way. “Call me if you need help with that.” Team building is a passion and gift! I’m a firm believer in IRA: Integrity, Reliability and Accountability as the core values for myself and team. Leadership is about helping the team and others be successful. 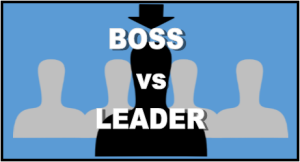 Suggested addition to the Boss/Leader graphic: Boss = Selfish, Leader = Selfless. Relationships are always built on giving. Key word “together.” Isn’t that what life is all about? Locking arms and unified in our efforts. We need less finger pointing and more humility. What leadership qualities would you add to the list?